Carbonated Blog: Take to the skies! A simple blog by a deaf geek adventurer who drinks way too much carbonated water. One of my earliest memories from childhood is sitting in the passenger seat of my father's small plane as he flew over the Northern Arizona terrain. Flying in a small plane has a magic all its own. In late 2006, I began taking pilot lessons. 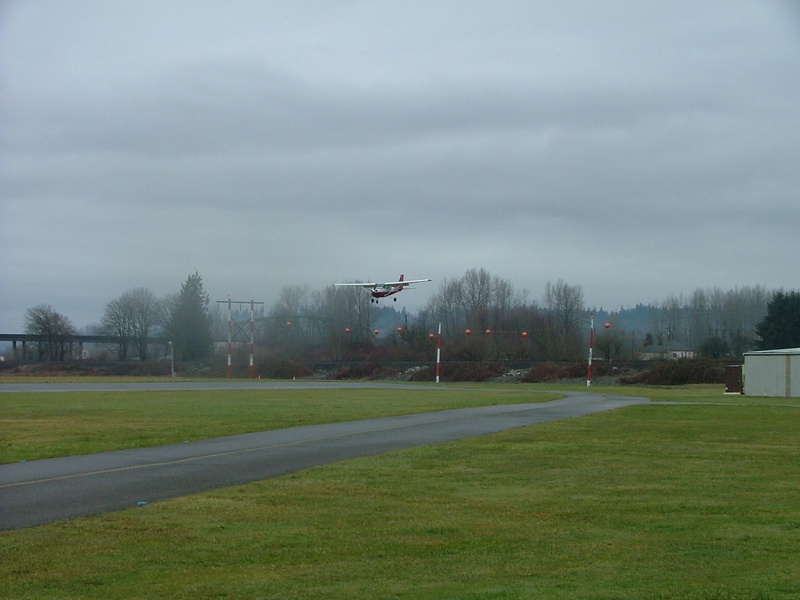 Using the Cessna Pilot Training course, I would show up, once a week, at Harvey Airfield in Snohomish, WA (Airport code S43), get behind the controls of a plain, and FLY. At this point, I imagine a bunch of you will ask: A deaf person is allowed to fly planes? The answer to that is a qualified yes. Licenses: There are many different variations on licenses: Private Pilot's, Commercial, Instrument, Two Engine, and more. Instrument requires radio operation, so I can't get that, nor any of the licenses that depend on Instrument. But we _can_ get any that don't require the Instrument license. Airspaces: Deaf pilots can fly in uncontrolled airspaces without a problem. And through previous arrangement, it is possible for deaf pilots to fly in and out of some controlled airspaces: Sometimes the tower uses a "light gun" to send visible signals to the plane and pilot. VFR: Deaf pilots can only fly under "Visual Flight Rules", or VFR. All radio traffic in VFR is advisory. If you make a mistake or fail to see somebody, it's your fault or theirs. Unfortunately, this also means we can't fly solo at nighttime: Nighttime is considered outside of VFR acceptable range. Unfortunately, I paid less attention to the lessons and more to just the sheer act of flying. Snohomish county, and the adjoining Baker Lake National Forest, are gorgeous. Cruising around, it was all I could do to keep my attention on flying safely instead of just staring out the window in a happy, contented daze. My progress continued until, on February 4, 2007, I went for a lesson, and after a few go-arounds, I was told by my instructor that I was ready to solo. Holy boop - it was darn near terrifying, taking off with an empty seat to my right. Yet the three takeoffs and landings I made by myself were the best I could have made. I barely felt them, as the tires gently snuggled up to the ground, making for the smoothest landings in my entire time as a pilot. I went back again the day after for three more takeoffs and landings, but unfortunately it would be the last time I'd be sitting behind the pilot's controls: Quite simply, I ran out of money. But the feeling has never left. I am content, staying at home and keeping my skills up with a flight simulator, saving up money for the next stage and big adventure in my life. Someday, I'll go back and complete my private pilot's license, then go further on as I pursue my ultimate goal in flight: Bush/Float planes. Hi! My name's Greg Millam. Definitely a geek, and not likely to ever change that. I have a ton of projects, and I intend to dump them here for public evaluation. I also have opinions, and they'll occasionally be going here as well. Sometimes the two will mix, other times I may post stuff here that I think would be important to be here. Zombies are awesome. So is Wikipedia. © 2011 Gregory Millam.. Simple theme. Powered by Blogger.